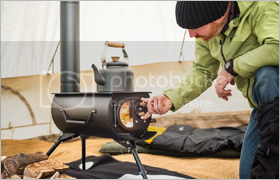 A lightweight, folding portable stove with a flue for heating and cooking in tents, sheds, vans and the outdoors. The stove packs down in minutes to a portable size, and with the sturdy side handle you can carry it wherever you set up camp. The large cooking surface allows you to cook with multiple pans at once on the top, while using the door vent to control the heat. You can also remove the top plate for direct heat from the flames. It weighs approximately 22 pounds. The flue comes apart and is stored inside the belly of the stove and the legs fold up. There is also an additional carry bag which makes transporting it around a little easier. The long flue funnels the smoke 2.5 m into the air – way out of face range. So cooking or heating becomes a more enjoyable experience. And it goes without saying that it is more effective than using an open fire, as it is much more fuel efficient. The campaign is almost over, follow the project here – Frontier Plus Kickstarter page for more details.